The Hokkaido Green Fund (HGF), a nonprofit organization (NPO)installing community wind power throughout Japan, announced that a new wind farm is now being installed in Monzenmachi, Wajima City,Ishikawa Prefecture. Ten MM-82 wind turbines (2.0MW each) produced by REpower Co. of Germany will be installed, giving a total rated output of 20MW. Construction started in September 2008, and the first turbines will be completed in September 2009. Trial operations will begin in December 2009, and in February 2010, commercial operation will startup. Noto Community Wind　Power　Co.，Ltd. is the main operating body. The company is 100 percent owned by Community Wind Power Co.，Ltd which was founded by HGF. The total costs for this wind farm will come to about 4.7 billion yen (about U.S$45 million). One third of the costs will be covered by subsidies from the Ministry of Economy, Trade, and Industry (METI). The rest will be covered by various sources, including finance loans from banks. The company currently has a loan of 90 million yen (about U.S$860,000) as reserve assets, which was collected by Japan Green Fund. 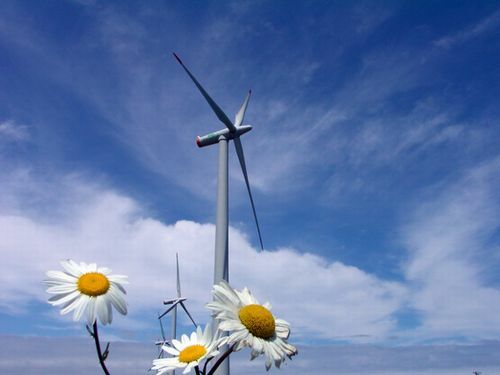 HGF has played a significant role in installing community wind power in Japan. Such wind turbines are called "community windmills" because local citizens can participate in the project in such ways as providing investment. Between 2001 and 2008, 11 wind turbines have been installed throughout Japan with a total rated output of 15MW. In February 2003, the Japan Green Fund was established as a citizen-fund in cooperation with HGF.